Tasty Appetizing Poke Bowl Served With Salmon, Avocado, Rice, Salad With Edamame. Grey Background. View From Above With Copy Space. Lizenzfreie Fotos, Bilder Und Stock Fotografie. Image 114631571. Standard-Bild - Tasty appetizing poke bowl served with salmon, avocado, rice, salad with edamame. Grey background. View from above with copy space. 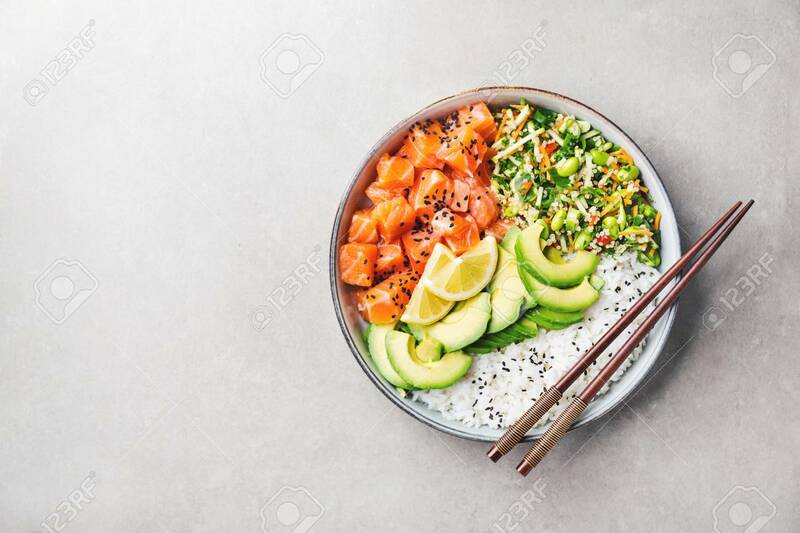 Tasty appetizing poke bowl served with salmon, avocado, rice, salad with edamame. Grey background. View from above with copy space.